iMacsoft DVD to BlackBerry Converter for Mac is a powerful Mac DVD to BlackBerry Converter designed just for Mac OS X users. It allows you to convert movie DVD to BlackBerry video and audio format with high quality. The Mac DVD to BlackBerry Converter can convert DVD to BlackBerry AVI, 3GP, MP4, WMV video format and extract DVD audio to BlackBerry MP3, AAC and M4A audio format for different BlackBerry phones. With this powerful Mac DVD to BlackBerry Converter, the output video and audio files can be perfectly played on your BlackBerry 8800, BlackBerry 8830, BlackBerry 8820, BlackBerry Pearl 8800, BlackBerry Curve 8300, etc. 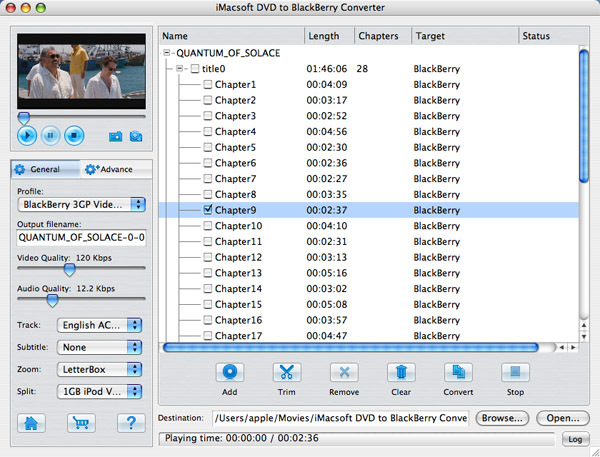 iMacsoft DVD to BlackBerry Converter for Mac provides a series of powerful settings. It lets you to customize file size, split output file, select audio track and subtitle, rip DVD audio clips and adjust video and audio	parameters like bit rate, sample rate, resolution, frame rate, etc. Batch process and multithreading conversion can make you have a easy and fast way to get target video and audio files for BlackBerry. Get started to experience a new portable lifestyle with BlackBerry by iMacsoft DVD to BlackBerry Converter for Mac right now! Enjoy the video and audio files with full-screen BlackBerry! How to convert movie DVD to BlackBerry MP4 video files on Mac? How to rip DVD to BlackBerry AMR audio files? How to convert DVD to BlackBerry 3GP video files on Mac? How to convert movie DVD to BlackBerry AVI videos?